Educated or uneducated , richer or poor , everyone to need an internet connection because the internet has become our basic necessity . If you have an internet connection then you will have to secure your online and offline security and protect your beloved children’s innocence from amoral , un healthy or in open words , adult content . If you think , you can do so through some settings , browser extensions , add-ons or something else like this then you are wrong because unfortunately on the other hand our children have become very smart and have lots of new and latest information , tricks and technisches about computing than us . They have a solution to tackle all your strategies . There are many softwares available in the market , these kinds of softwares especially designed for this purpose . But I think buying these softwares is not a good approach because then you will have to spend extra money on buying an antivirus software . But fortunately the encouraging thing is that these days almost every antivirus software developer company understands very well this parent’s problem . Specifically try to improve this feature in every new edition . Today’s software is an antivirus software and can fulfil both needs , your online and offline security and as well as your beloved children . 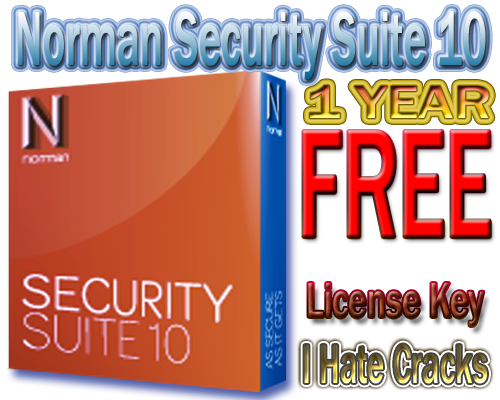 Today’s gift is Norman Security Suite 10 with 1 year subscription worth 54.95 € per serial number or license key for free . The best thing that I found after reading its full list of features that unlike other antivirus softwares latest Norman security suite 10 does not slow down your computer/laptop speed and performance at all . The system footprint is smaller, dramatically reducing the initial load and running environment . If you want to use it then you will never face this headache . It is fully compatible with Windows 8 . Norman Security Suite 10 has an effective foolproof parental control . It’s easier and more intuitive to set up parental controls to ensure that children are safe on the internet . And without entering correct password no body can break your security circle . Norman Security Suite 10 has an easy to use and user friendly graphical user interface and Norman Security Suite 10 gives smart default settings to make all this easy for you . Norman Security Suite 10 is latest version and in this new improved version , The new interface is simple to navigate and includes pragmatic default settings . Built-in rootkit protection prevents unauthorized programs from taking control of your computer/laptop . Automatic virus, spyware, spam, and phishing protection recognizes, blocks and removes viruses, worms, Trojans, malware damage and other destructive code. This protection also prevents you from inadvertently revealing personal information that can be used for fraudulent purposes . Redesigned and improved antimalware engine provides better protection, blocking and cleaning tools for a wide range of security threats . Intelligent personal firewall doesn’t disrupt your online activities . Better protection, blocking and cleaning tools – The redesigned antimalware engine offers better protection through identifying, blocking and cleaning all types of threats. Enhanced personal firewall – The program incorporates an intelligent personal firewall that protects content while recognizing trusted sources without disrupting your online activities. The price of Norman Security Suite 10 is 54.95 € per serial number / license key but you can grab a license / serial number to enjoy 1 year security for free . Check your mailbox you will receive a license / serial key in mailbox . You can download Norman Security Suite 10 from here .